This warm easy knit hat pattern is a fast and fun quick knitting project. And for those of you who prefer working on straight knitting needles this is a two-needle hat pattern for you to enjoy. I do prefer knitting hats on 2 needles and I'm sure some of you do too. I just find it more fun. This easy hat pattern will make a great last minute gift or a super project if you're knitting for charity plus it's simply a nice easy knitting project. For beginner knitters this easy knit hat is a small step up from my garter stitch hat pattern as it will help you practice a couple more knitting techniques, rib stitches and the K2tog (knit two stitches together) decrease. I'm also providing the links to both techniques so that you can check out how they're done if you need too. 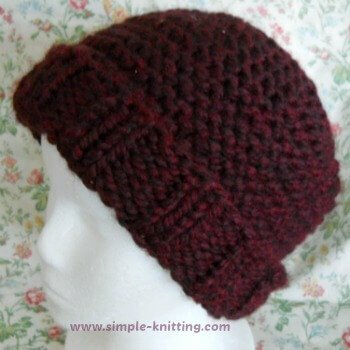 For all you experienced knitters out there this is a lovely relaxing quick knitting project to enjoy plus if you like knitting hats for charity this hat is a great choice as it knits up in no time. Notes: This quick knit hat will fit most adults because it's nice and stretchy. The measurement from the crown to the ribbing is about 9 inches (sewn up) so it actually fits really nicely on your head. When I designed it I made it for a head measurement of 20 inches however it really is very stretchy and will fit most adults. With smaller needles (US 13) cast on 52 sts. I used the long tail cast on. Knit 2 X 2 (K2, P2) for 2 inches. Switch to larger needles (US 15) and knit garter stitch until work measures 7 inches from beginning. Break yarn and thread through tapestry needle. Push needle and yarn through remaining sts and pull tight. Push needle through sts one more time. Seam up and weave in ends. Enjoy!